Last I checked, this character's cosplay outfit was available at Milanoo. The above info came from Mike Rain, and was edited by yours truly (contact me). The image came from japan pop kultur forum. Express yourself! Contact me if you have any questions, comments, complaints, or corrections. Tsunade, or Granny Tsunade as Naruto would call her, is one of the three legendary Sannins that was trained under the 3rd Hokage, also known as Sarutobi, along with Jiraiya and Orochimaru. Unlike Orochimaru and Jiraiya, she has incredible super-human strength and a bad temper to go along with it. 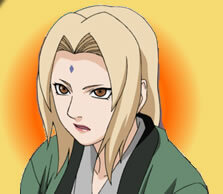 Tsunade also happens to be the grand daughter of the 1st Hokage. She is a spontaneous person who loves to gamble, even though she is horrible at it and always ends up losing. Her grandfather died fighting a great war when she very young, and everybody in her life that wished to become Hokage in the future, like her brother and boyfriend, also ended up dying. So she goes along traveling the world, with her student Shizune and Pig Ton-Ton, borrowing money from banks and loan-sharks to gamble and lose it. Because of her troubled past, she resents and refuses to go back to Konoha (the Hidden Leaf Village). A turn of events then happen involving Orochimaru and she then she finally decides not only to return to Konoha but to also take the place of her deceased sensei and become the 5th Hokage. As Hokage, she tries to rebuild the almost obliterated village of Konoha. Tsunade has a huge fear of blood, but she gets over it when she was fighting Orochimaru... which is good, since she is a medic. Toward the end of episode 96, Tsunade has flashbacks to her days with Dan, her boyfriend, and her little brother Nawaki. They both wanted to be hokage, but unfortunately both died. 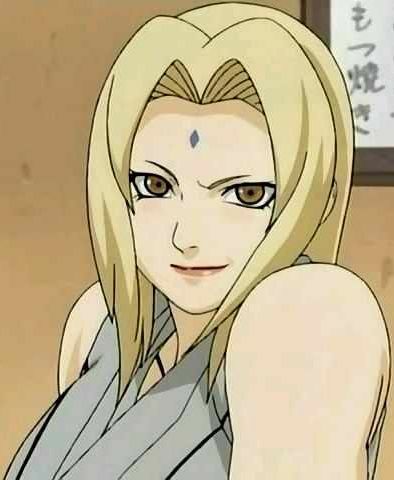 Tsunade gave them a necklace that belonged to her grandfather, the 1st Hokage, but it was given to and meant only for her (though with the chain of events that occurred, it seems to belong to those who are meant to be someone important to Konoha, as in the hokage). She gave both Kawaki and Dan the necklace, and they each ended up dying from it. Naruto is like a little brother to Tsunade because he looks like her younger brother, and has most of the traits that Dan had including goals which is to be hokage and protect the village. She offered a challenge to Naruto, telling him that he couldn't master the Rasengan in a week, but if he could then she would give him the necklace. Of course, he did win and he got the necklace, but he didn't die. 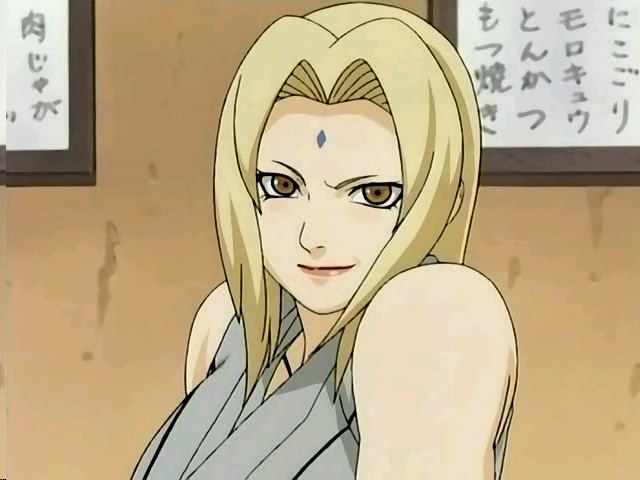 Tsunade is believed by some to bethe Yondaime's aunt, which, if true, would make her Naruto's great aunt. Also, the diamond symbol on her forehead is very important because it allows her to store chakra to use when needed, such as keeping her looking young or regenerating from wounds, but at a cost of taking away years of her life doing so. The symbol on the back of her coat, "kake", means "gamble" or "wager". The above description came from Mike Rain and Amelia, and was edited by yours truly (contact me). The image came from Mike Rain.